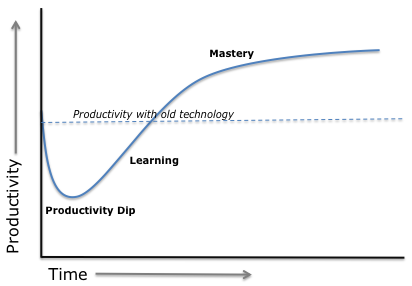 You may have seen a chart like this before; the productivity curve is used to show one of thechallenges of software delivery. The general idea is that when you first use a new product (or technology), your productivity always plummets in the short term. No matter how much better the new stuff is, you will be less productive using it at first, because you were more familiar with the old stuff. However, as you become more proficient with the new technology, your productivity gradually increases, and eventually your productivity will be greater than it was with the old technology (assuming the new technology is actually better). Forced practice was straightforward enough: I dedicated time to reading references, running throughtutorials, and solving regex challenges. This practice was an important step in building the skills, but I had tried this to a certain degree before. I’d spend a few hours practicing regular expressions, and feel like I was getting the hang of it. But time would pass, and the next time I needed to fix a regex, I’d have forgotten most of it again.